During the 1960s, many independent graphic design firms sought to establish a new style of graphic design, perhaps as a way to find alternatives to the rigid International Style. The Push Pin Studio was a highly influential firm that was part of this new wave. Originally found by Reynold Ruffins, Edward Sorel, Seymour Chwast, and Milton Glaser, the Push Pin Studio explored of a vast range of visual styles by borrowing from many different art periods, combining both popular culture and the fine arts. Glaser and Chwast took the role for artistic direction at the firm, embarking a new perspective of design and style. While the International Style represented seriousness, the designers of the Push Pin Studio played with humour and caricatured drawings (Eskilson, 2012). One major approach Glaser and Chwast took on their work was looking back to historical designs and adopting styles that appear dated or obsolete to see them in new light. For example, Chwast created a cover for the 1959 The Push Pin Monthly Graphic issue. The cover takes inspiration from an earlier work by Dada artist Tristan Tzara, Bulletin Dada (no. 6), a periodical produced in 1920. Tristan Tzara was a French-Romanian poet. 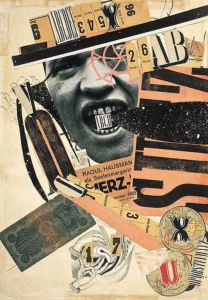 He edited and published the journal Dada, with the intention to spread the revolutionary Dadaist views in Zurich and other European cities (Eskilson, 2012). The top half of Tzara’s Bulletin Dada is taken up by the extremely large grotesque text ‘DADA’ and the bottom half is occupied by relatively smaller text and with more context and information. 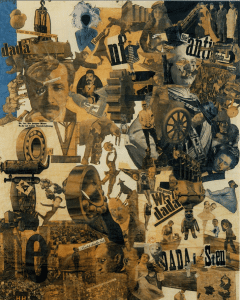 Some texts are overlapping each other and some texts lie diagonally across the page; it illustrates Dada’s nonsensical characteristic and a sense of improvisation and is realized here. The contrast in weight and different orientations of text create a sense of hierarchy. This in turn makes it easier to read the text in the disorganized and eccentric style Tzara depicts. He also used six to seven different typefaces, which also alludes to the dramatic and wackiness of the Dada aestethic. Influenced by Tzara’s design, Chwast’s 1959 cover uses wooden type. Chwast differentiates his design from Tzara’s by aligning text in a narrow, vertical layout. As a result, a definitive hierarchy exists that leads the eye from top to bottom; the direction the artist intended for reading. The elongated and stretched letters ignore the rules of typography but coincide with the absurdity of Dada. Dada was a social protest in response to WWI, as well as the European culture that cultivated it. It questioned bourgeois society and opened doors to a satirical style (Russell, 2012). In a similar way, The Push Pin Monthly Graphic was an investigation of different forms of graphic design to in a way, protest against certain schools of thought. As a matter of fact, The Push Pin Monthly Graphic was not a real periodical, but a platform for the studio’s artists to explore new styles. Rather than committing to one artistic movement or style, creative decisions were made based on what looked inspiring to them as artists of such bewildering expression. Eskilson, Stephen J. Graphic Design A New History. Yale. 2nd ed. New Haven, Connecticut. Published 2012. Russell, C. “Dada.” The Princeton Encyclopedia of Poetry and Poetics, edited by Roland Green, et al., Princeton University Press, 4th edition, 2012. Credo Reference, http://ocadu.idm.oclc.org/login?url=https://search.credoreference.com/content/entry/prpoetry/dada/0?institutionId=4079. Accessed 03 Apr. 2019. Art deco is described as angular and highly stylized, with its distinguishing features of simple, clean shapes applying emphasis on geometric shapes, as well as using cultural symbols to integrate things like popular media, cultural significance and aesthetic value. 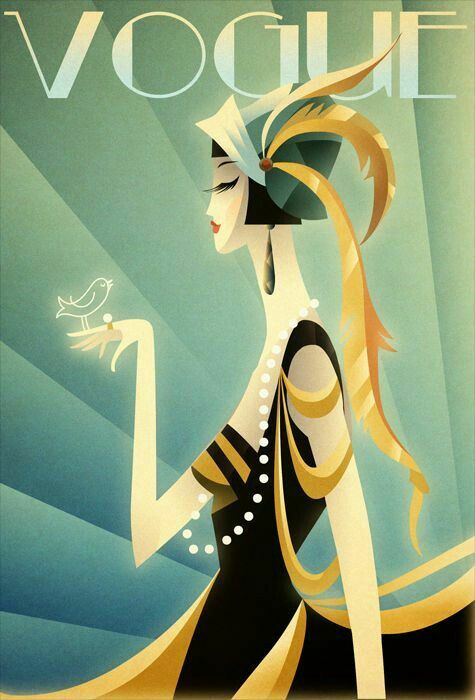 The first picture is a stylized female figure in the art deco style which originated from the Cubism art movement, utilizing basic shapes and mood suggesting colours art deco became increasingly popular as artist enjoyed the different possibilities allowed through this art deco style. The Art Deco style is clearly recognizable through both pieces with their slick, stealthy designs using sharp edges to create visually interesting components in their respective pieces. Their is similarity in the flat colours that illuminate the separate planes creating distinguishable shaded areas, to the backgrounds, and in the figure its self. They both use a small range of colour but the colour choice chosen express the over all feeling the artist was going for. 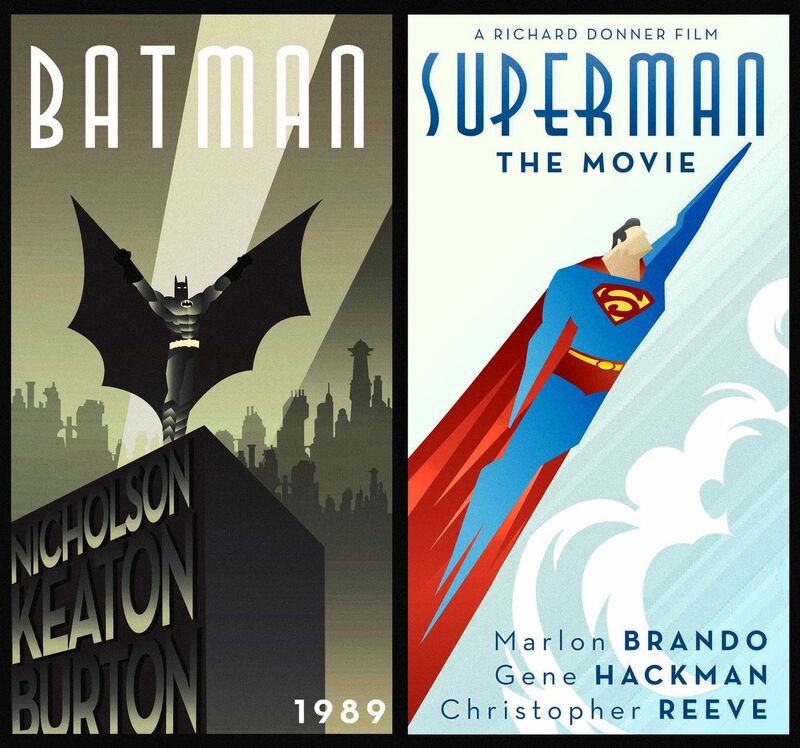 These similarities are the influence Art Deco had in the world of media because the style allowed for anything to become visually pleasing with certain design decisions that are a main stay components to any Art Deco inspired piece. 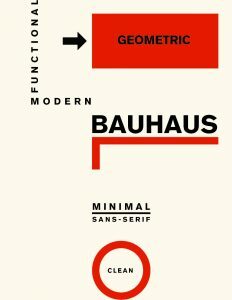 The International Style, also known as Swiss Style, is a formulaic, simple and visually pleasing form of graphic design that has been used Internationally since it’s inception in 1950’s Switzerland. The goal of the Swiss Style was to create an internationally understood form of design that doesn’t leave any room for bias or misconceptions. This was a time where international trade was rising, henceforth the importance of these non-propagandist designs were more crucial than ever to be able to communicate effectively. Whether the design is asymmetrical or linear, it follows a grid. There are formulas to the process that have been perfected and are religiously followed, which are easy to distinguish in this movement. Josef Muller Brockmann effectively communicates in the Zurich Opera House poster all of the important details about the event without any construed/distracting info. Rodo Abad, 40 years later, critiques the Swiss Style and makes basically the same poster as Brockmann, (since there is a formula to follow it is very easy to compare the two), and declares that anything written in Helvetica is art. The formula is a work of art and I have to agree with Rodo Abad, even though he is kidding. He is critiquing that the entire movement all looks the same, and that it leaves no room for creativity. In conclusion, Rodo Abad takes inspiration from Brockmann and the entire Swiss Style movement to critique and mock the entire style for being too constructed. The images I chose to speak about are Rodchenko’s “books” advertisement and the modern day piece that took inspiration from it, the Saks on 5th advertisements for their line. The similarities between these pieces are uncanny and the fact that Saks on 5th took heavy inspiration from Rodchenko’s work is evident, from the dramatic and poignant lines to the red white and black colour pallet, even down to the use of collaged images to create a certain aesthetic that directly reflect what Alexander was doing with his posters in the 20’s and 30’s. 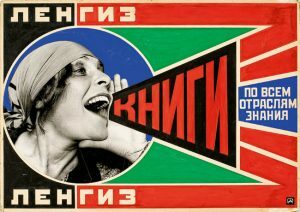 Alexander Rodchenko was a designer who explored many mediums but in this example he has chosen graphic design and collage, using photography and type to create an impactful image with the style known as photomontage. He was part of the Russian Constructivism movement and was greatly influenced by cubism and futurism. Saks on 5th uses the same colours and themes as well and photomontage in their adverts however the meaning and symbolism does not come from the same place. They are emulating the propaganda of the 30’s and 40’s to make their own tongue in cheek statement about their feelings on the recession in America. Art Nouveau came about in the late 19th century and though short-lived, didn’t fail to make an impact. Art Nouveau posters and graphics, in particular, had a very distinctive look. These graphics were typically highly decorative and used hues such as green, orange, yellow, purple or red. They featured curvy lines and often incorporated an unmistakable typographic style. This poster-style made a come back in the 1960s during the hippie era since its floral, decorative designs tied in with the movement’s focus on nature. A good comparison where we can see how this historical graphical style influenced a later design is with the images below. The image to the right titled, JOB was created by Alphonse Mucha in 1897. In the poster, Mucha placed a prominent female character against the JOB monogram as her background. She holds a cigarette with her long hair drawn as flowing lines. The woman’s head is leaning back in a sensual manner as she holds the cigarette. The background colours used are very cool in tonality in comparison to the warmer colours used on the main figure. Similarly, the poster to the left which was created in 1967 advertising a concert, with Big Brother & The Holding Co. The designer undoubtedly used elements of the movement and Alphonse Mucha’s poster for inspiration. The poster makes use of the same natural female form and similar linear treatment to the hair. It is also very fluid in nature, however, the one stark difference lies in the bright, vibrant colours used which were commonly attributed to the psychedelic 60s. 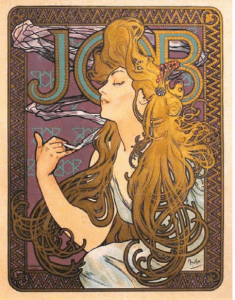 The influential historical design I picked is “Job cigarette paper posters” by Alphonse Mucha, which is a typical Art Nouveau poster, which had influenced later designs with its style (Art Nouveau style). I found the iconic “I ♥ NY” branding poster done by Milton Glaser that part of it was influenced greatly by the style of Art Nouveau, such as this design done be Alphonse Mucha. There are some major characteristics of Art Nouveau have been used in this modern poster, in which can be reflected by both of the designs. 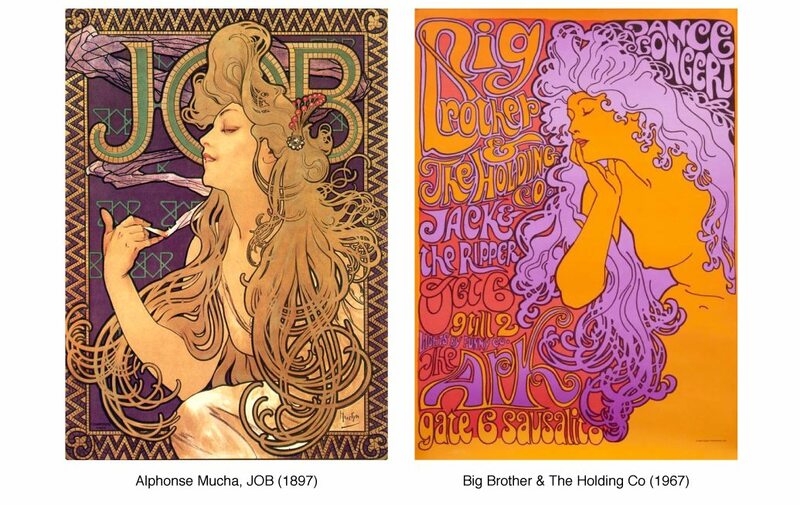 Firstly, the organic lines; Milton Glaser have used organic lines for his poster (left and right part of the poster), in which we can see organic lines are also being used in Mucha’s design. Secondly, Art Nouveau emphasizes the shape of natural elements, and the modern poster shows the shape of natural plants and flowers at the same time, this element can be found within Mucha’s design as well. Lastly, is some difference between the historical design and the modern design. Although we can see some obvious Art Nouveau elements that are used by Milton Glaser in his design, we can see the how design have been changed from the past to today among those posters. The early Art Nouveau design usually apply colour in a harmonic way, but the modern poster shows us a lot different colour in contrast and more eye catching. Maybe our society is now more complex than the past, that strong contrast in colour will better catch the viewer’s attention. Mid-twentieth century was the time of development of graphic design. The most successful art movement was the Swiss Style or was also called the International Typographic Style. 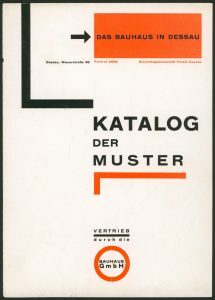 The style originated in Switzerland in the 1940s and 50s, led by Josef Müller-Brockmann and Armin Hofmann. The Swiss Style was illustrated in simplicity, legibility, and objectivity. This is why posters evoke Swiss Style usually favor the use of san-serif typeface, strong structure of grids, and blocky layouts (Eskilson 288). The style replaced illustration with realistic photos for poster design. Swiss design has a preference for photography and works featured typography. The first sans-serif typeface used commonly in posters was Akzidenz Grotesk, released by the Berthold Type Foundry in 1898. The typeface does not have geometric forms, still able to read and fit well with pictures. On the other hand, Akzidenz Grotesk was criticized as a tedious font and could not get enough attention from viewers (Eskilson 290), but was still chosen by designers as a safe choice for their poster design. With its fame, in 1957 Eduard Hoffmann decided to release a new typeface intimidated similar characteristics like Akzidenz Grotesk but with low weight contrast, which was called Helvetica. Swiss Style is synonymous with Helvetica, its full name Confoederatio Helvetica means Switzerland in the Latin language. The typeface later was popular during the 20th century, it hit the market in the 1960s and became a hallmark of the International Typographic Style (Eskilson 290). 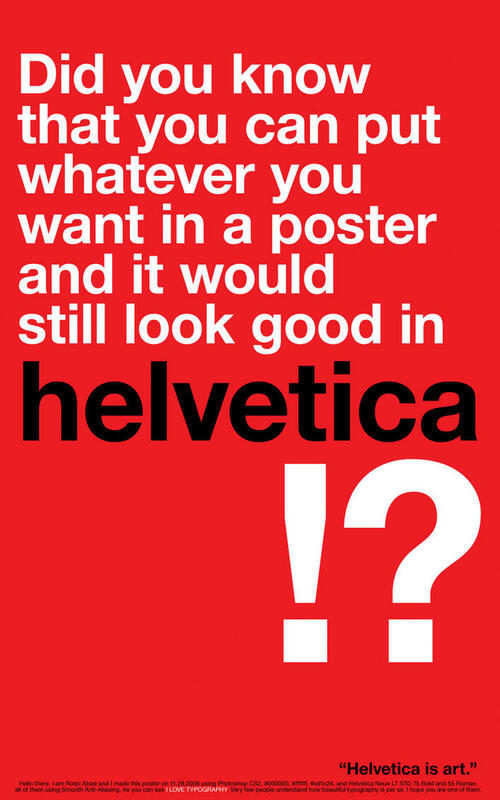 The importance of Helvetica cannot be underestimated, we could see the typeface is used for everything from signage to web pages or logo, and headlines of books due to its legibility. Helvetica was designed to be rigid and consistent, and since it works featured photography, the typeface can’t be distinctly expressive. 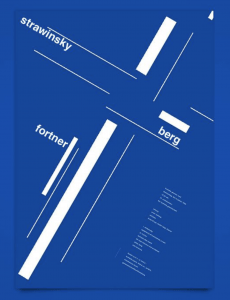 One of the important elements in Swiss Style was the asymmetrical organization of content, to make the whole composition in poster look active and dynamic. An example illustrated Swiss Style clearly is “Zürich Town Hall Poster”, designed by Josef Müller-Brockman in 1955. The designer still uses a grid to organize the whole content as it is mandatory. There is no symmetry in the poster, but it doesn’t cause the content is chaotic, and give the greater sense of unity. Poster has two primary colours are white and blue, which emphasized more to the positive and negative space in the design. All these elements and principles applied to the poster has made the “Zürich Town Hall Poster” became simple and minimal in aesthetics. As a student studies graphic design, every design I make that involved with typeface, all have to rely heavily on the use of a grid. Furthermore, the majority of my designs embrace asymmetry. 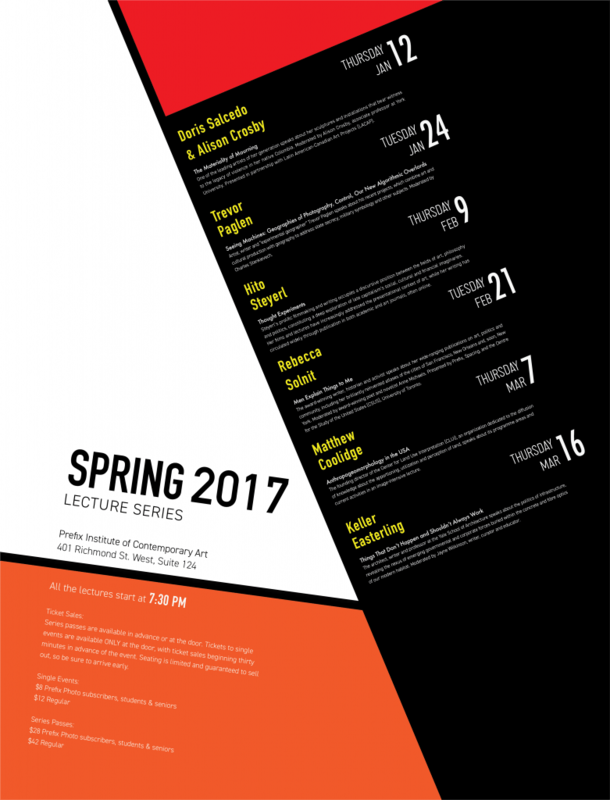 The poster below I designed for a lecture series event in 2017. I did not choose Helvetica as the main typeface, but the concept was inspired by Swiss Style. The poster doesn’t contain too much design or any photos because I want to keep it simple and legible. The whole content is organized based on a grid, however, it doesn’t lack intensity and hierarchy because it evokes asymmetry, which supports the rhyme, movement and dynamic characteristics of the poster. My Vuong, Prefix Institute of Contemporary Art Poster, 2018. Poster. Toronto, ON. Eskilson, Stephen John. Graphic design: a new history. Conn., 2012. Design Inspiration: Herbert Bayer, The Bauhaus in Dessau: Catalog of Models, 1925. The Cut with the Dada Kitchen Knife through the Last Weimar Beer-Belly Cultural Epoch in Germany, created by Hannah Höch in 1919, was a typical artwork of Dada. It was famous from the bold political collage and photomontage works. She used images and text which were frequent in daily life to critique the “decadence, corruption, and sexism of pre-war German culture”(The Art Story, 1). The strategy of combining formal elements which were unrelated to each other and coming out some new ironically images was a bold innovation at that time. Both of them used collage way to express artists’ own ideas but ignored the aesthetics to some extent. They did not emphasis on the composition or the color use, but focus on how to show the intentions to audience better with a shocked image. Alexander Rodchenko is one of the most important avant-garde (Constructivism) artist to have put his artworks in the service of political revolution. In this regard, his career is a model of the clash between modern art and radical politics. He emerged as a fairly conventional painter, but his encounters with Russian Futurists propelled him to become an influential founder of the Constructivist movement. And his commitment to the Russian Revolution subsequently encouraged him to abandon first painting and then fine art in its entirety and to instead put his skills in the service of industry and the state, designing everything from advertisements to book covers. After Rodchenko retiring from painting, he experimented with many different mediums, like photography, sculpture, and graphic design. 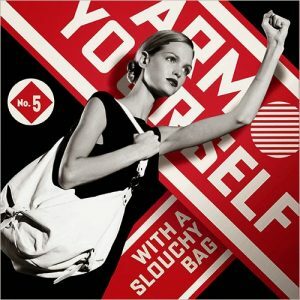 GRAPHIC APPEAL Saks Fifth Avenue has turned to Shepard Fairey, whose work captures the bold style employed by Rodchenko in the 1920s. “Books” is an early example of Rodchenko’s Constructivism graphic designs. The composition is typical of his use of photomontage in the period which is the combination of photography and text. Photography was important to Rodchenko in the 1920s in his attempt to find new media more appropriate to his goal of serving the revolution. Also, he uses geometric compositions, bright colors (but limited color palette) and new typography known as Russian Avant-Garde to trumpet modernity and a new manifesto. 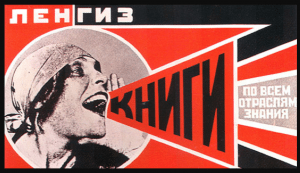 By using the red color, Rodchenko reminds the audience of the revolution, and the geometric shapes evoke strong emotions and combine the needs of the state with artistic expression. As political advertising propaganda, it successfully promotes an idea and inspires a feeling of guilt and duty. An American artist was influenced by Russian Avant-Garde art. In the past few years, Saks Fifth Avenue, an American luxury department witnesses a finical recession as everyone else in the world. They secede to raise a stand with its new spring marketing. The designer Shepard Fairey designs the poster “Graphic Appeal.” It is inspired by Constructivist art with its unique colors and similarities to Redshank’s type. Two artworks show similarities in text style and limited color palette. The thick and stable text style with a high color contrast become an important part of the design, also the conspicuous text could attract the audience’s attention easily. Three colors are used (red, white, and black) in “Graphic Appeal,” and five colors are (red, white, black, green, and blue) in “Books.” However, “Books” shows complementary colors like red and green, which provides a strong contrast. Shepard uses black and white photography of a woman like Rodchenko did before. The photography geometric shapes surrounded by red, which helps the mood to shift towards the idea of propaganda and warn customers to get ready for shopping. The poster is only used for grabbing attention but not containing or even closing to any political statements. 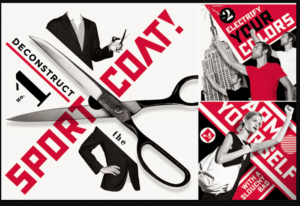 The constructivism movement had a huge impact and inspiration on graphic design later. Design now is used to deliver a message to the audience through visual communication. And the movement shows how impressive design can truly be if it is created with an intention and a purpose. “Alexander Rodchenko Biography, Art, and Analysis of Works.” The Art Story, www.theartstory.org/artist-rodchenko-alexander.htm. Goldsmith, Joey. “Original Creators: Constructivist Aleksandr Rodchenko.” Creators, 3 Dec. 2012, creators.vice.com/en_uk/article/mg9zd4/original-creators-constructivist-aleksandr-rodchenko. Wilson, Eric. “Soviet-Era Art Inspires a Saks Ad Campaign.” The New York Times, The New York Times, 7 Jan. 2009, www.nytimes.com/2009/01/08/fashion/08ROW.html.